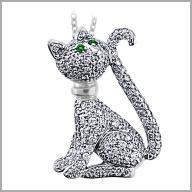 Look chic sporting this cute little cat encrusted in diamonds. The playful pendant is made of 14K white gold and features 107 round cut diamonds in pave setting .Total diamonds weight is 1.53ct have a color of H and SI in clarity and have two TSavory round stones, total weight of 0.060ct. With a hidden bail, the pendant's presence of diamonds keeps the vibe sophisticated.